The Vdara is one of two non-gaming, no-smoking hotels within the CityCenter complex. Opened in 2009, it is all-suite, with 1495 rooms over 57 storeys. Its unique curved design delivers six ‘corner’ suites per floor, offering wonderful vistas of Las Vegas. A real highlight is the Vdara’s spa and salon. Spreading over two floors, this is the last word in luxury and well-being. An eco-friendly operation, it offers a mixture of traditional and speciality treatments, using natural and organic ingredients wherever possible. For a complete spa experience, why not take one of six specially-designated spa cabanas at the Vdara Pool and Lounge? Enjoy the cabanas’ special features like music and refreshments, whilst being pampered with, for example, seasonal treatments from Akhassa using exotic Thai ingredients. The cabanas on the third-floor pool area are the perfect chill-out area. Rising above the hotel’s grand entry, with wonderful views of Las Vegas, it’s a great place for a made-to-order cocktail or gourmet tapas selection. There are plenty of private retreats and semi-secluded plunge pools as part of this extremely refined environment. If fitness is your priority, head for the Vdara’s naturally-lit, state-of-the-art Fitness Centre. You’ll find the very latest cardio equipment, with personal entertainment centres. There are plenty of other exercise machines and a separate free weights area. Personal trainers and yoga instructors can help you individually or as part of a group. Use of the Fitness Centre is free for all Vdara guests. Pop into the Smoothie Bar at the Spa/Salon, for a delectable and nutritious range of smoothies, healthy snacks and, because its Vegas, a selection of fine champagnes too. When you’ve finished your time at the pool or in the Fitness Centre, the Vdara’s Salon for men and women will ensure you look your best when you hit the town. There’s expert advice and styling for hair, nails, and, if you like, your make-up too. Guest services are very special at the Vdara too. The dedicated concierge and tour desk is the way to get into the best restaurants, shows, tours and other Vegas attractions. Call ahead and they will swing into action before you even arrive, so that you don’t have to waste a minute of your Vegas visit. Golfers will appreciate the exclusive use of the nearby Shadow Creek course, with its beautifully-landscaped, yet challenging aspects for all levels of player. If you book ahead there’s the opportunity to play several other courses, including one on The Strip itself. Shopping is outstanding locally too. Just a few steps away, there’s a whole world of upmarket shopping in the CityCenter. It offers some of the world’s most elite brands - from haute couture to sportswear, jewellery to the most gorgeous accessories. Transport is taken care of with a regular 24-hour shuttle service to the airport, complimentary valet parking and special benefits for those using ‘green transport’. If you want to travel around Vegas in big American style, the concierge can call up a limo, up to an ultra-stretch SUV with room for 16! Eating and drinking is available in the Vdara itself, from hot breakfasts to light lunches and sumptuous evening meals. The Room Service menu is available at any time of the night or day in your suite. In addition, a huge range of possibilities is a short stroll away in the Aria Resort. There, casual dining rubs shoulders with Michelin-starred wonder chefs. The Market Café at Vdara offers a boutique grocery store offering, with fresh fruit and veg, meats, wines and cheeses. This hotel is a professional meeting centre with real sophistication and style, plus full services and high-tech facilities to match. In keeping with the Vdara’s style, you’ll experience exceptional service with the intimate approach, especially suited for gatherings of between 10 and 300 guests. Venue choices include everything from an impressive ballroom through to an executive boardroom. The Silk Road is a venue worth noting, a unique and flexible meeting space with stunning, sleek-lined modern design. A real statement room for up to 200 guests. 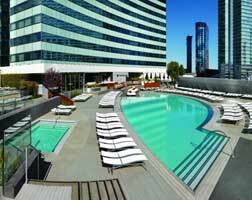 Other very special opportunities will create a good impression and unique atmosphere at the Vdara Pool and Lounge. For something small and discrete, consider a private poolside cabana. A dedicated Business Centre takes care of all the services and back-up you’ll require to work efficiently and professionally. Weddings too will be extra special here, with beautiful venues, helpful wedding planners and gourmet dining.